Sold by Excel Innovators (4.9 out of 5 | 516 ratings) and Fulfilled by Amazon. Gift-wrap available. 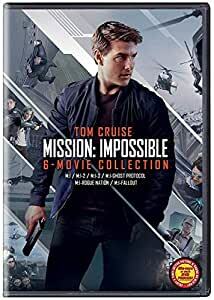 The action thriller series includes all Mission Impossible movies: M:I + M:I-2 + M:I-3 + M:I-4 Ghost Protocol + M:I-5 Rogue Nation + M:I-6 Fallout.